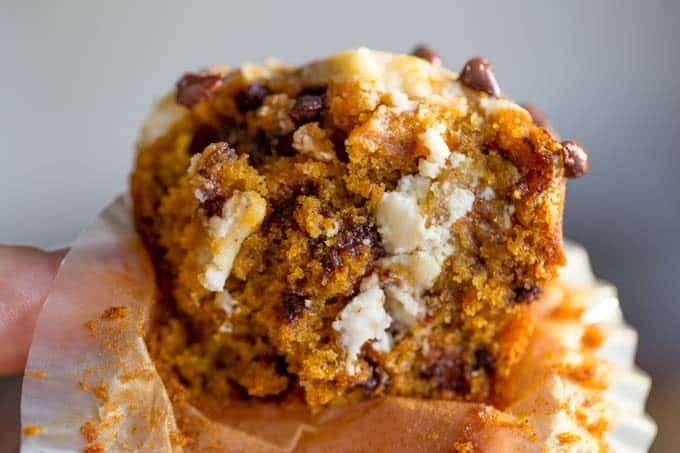 Chocolate Chip Pumpkin Cream Cheese Muffins are the perfect coffee shop or bakery style treat you’ll love all year round, full of tangy, sweet and warm flavors. 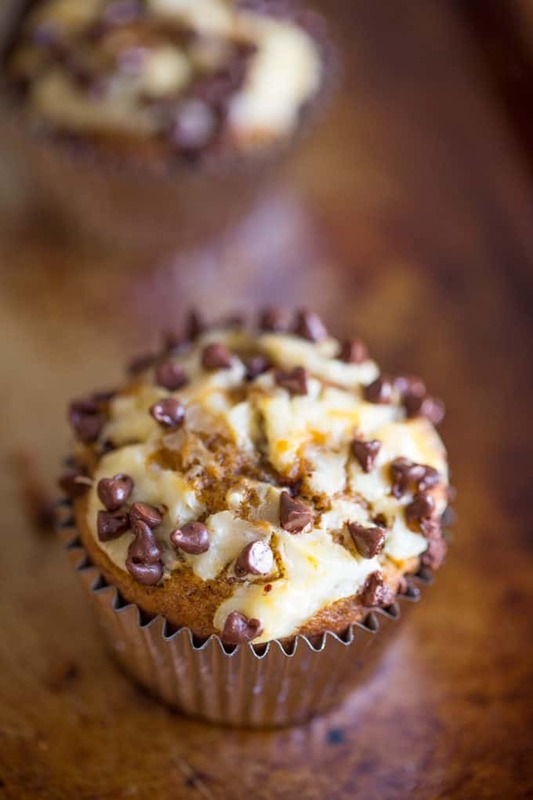 Chocolate Chip Pumpkin Cream Cheese Muffins are kid sister to the Chocolate Chip Pumpkin Cream Cheese Bread I posted on Saturday. 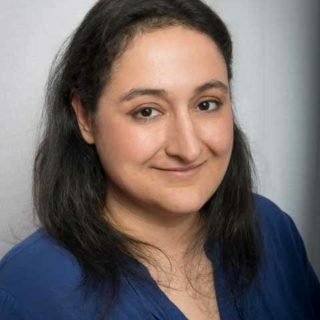 Why am I making this a separate post you ask? A: Different quantity of ingredients unless you want 48 cupcakes! B: Different method of assembly and mixing of batters. C: Different baking times. 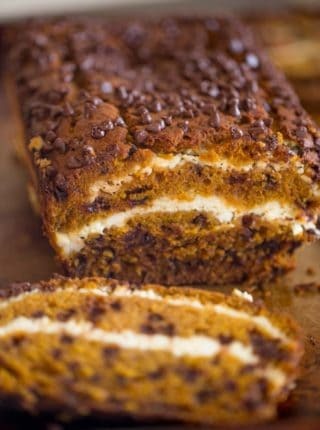 That Chocolate Chip Pumpkin Cream Cheese Bread has been a recipe I’ve been wanting to make for quite some time. 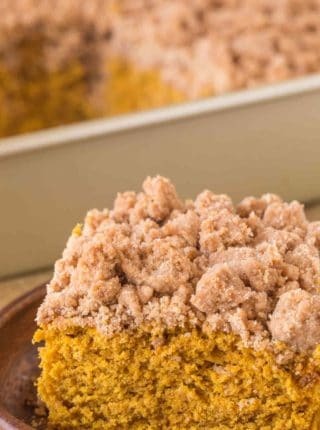 Last year I made my Cheesecake Filled Pumpkin Bread Bars and my Chocolate Pumpkin Bread, but the delicious cream cheese, pumpkin and chocolate combo of this recipe is just irresistible. Basically hey these muffins are a different animal to the bread. These beauties are quicker, more portable, able to be served to large crowds easily and oh, by the way they freeze amazingly. Plus can you really tell me if you were offered one of these delicious muffins you would turn them down? Ice Cream Scoop: Perfect for portioning the muffins and quickly scooping without blending the batter too much. 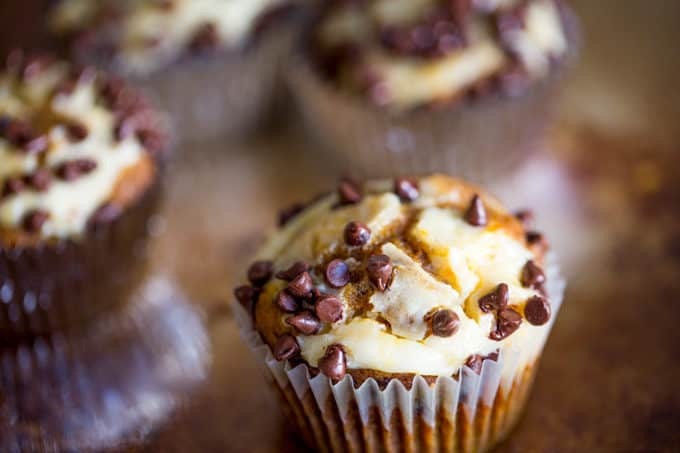 Mini Chocolate Chips: The mini chips are the perfect size for these cupcakes, they don’t overwhelm the top and perfectly dot throughout the middle. Canned Pumpkin: Different than your pumpkin pie filling, this is pure pumpkin. AllSpice Spice Rack: I use this spice rack and fill up the bottles with freshly purchased spices. PS, we’re talking a huge difference, last week I bought nutmeg in bulk (enough to fill the bottle) for under a dollar and the bottled variety in the store was almost seven dollars. Foil Baking Cups: These are double lined. So if you bake them in the foil/liner cup and decide you would rather ditch the foil, you can peel the foil off and have a neutral colored liner. 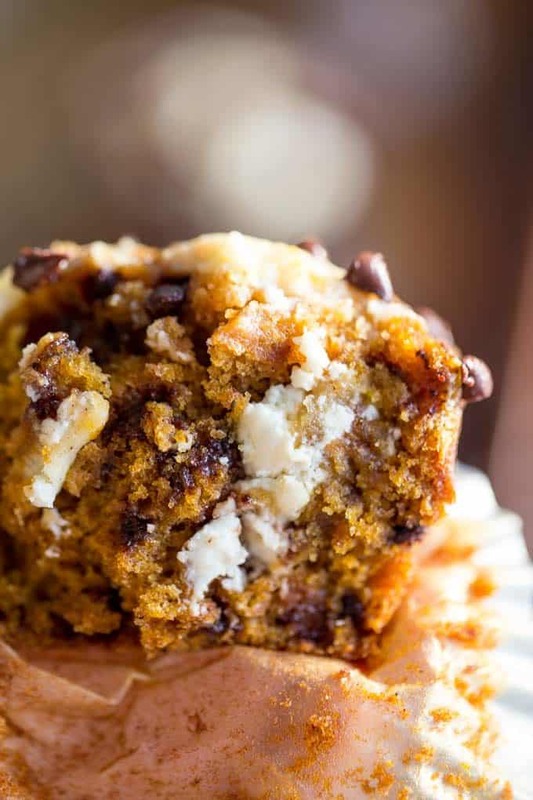 Chocolate Chip Pumpkin Cream Cheese Muffins are the perfect coffee shop or bakery style treat you'll love all year round, full of tangy, sweet and warm flavors. 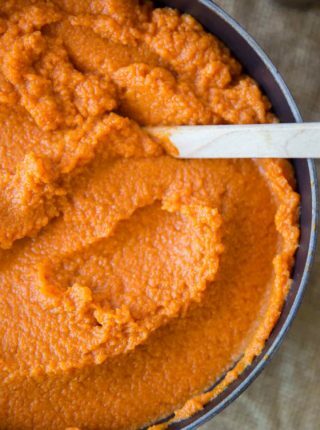 In a large bowl add the pumpkin, brown sugar, granulated sugar, vegetable oil, eggs, vanilla and 1/2 cup of the chocolate chips to the bowl and whisk until completely combined. Add the flour, baking soda, salt, cinnamon, ginger, cloves and nutmeg into the bowl and whisk until just combined. To make the cream cheese layers, add the cream cheese, sugar, egg, milk and vanilla. Add the cream cheese layer to the bowl of pumpkin batter in spoonfuls and mix just a tiny bit, just enough so the clumps are slightly connected. I have fell in love with this recipe!!! It is absolutely perfect for the fall. 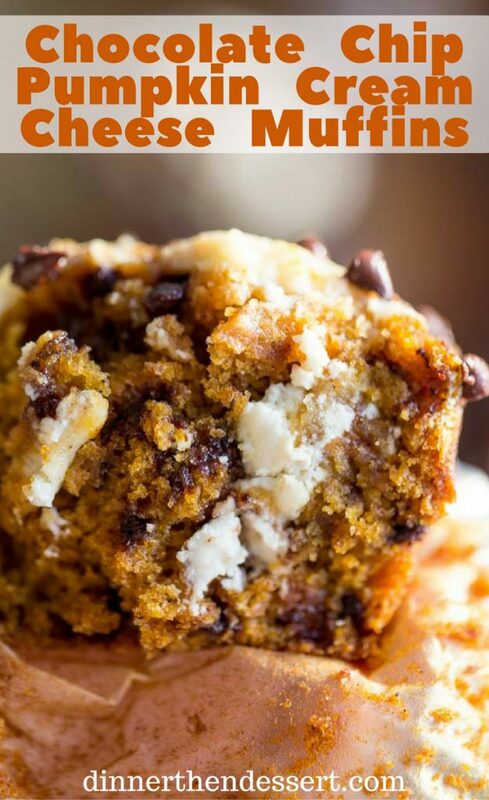 I’m entering a muffin making contest for my local fair, and hopefully I’ll win with this delicious recipe. These look amazing! Going to attempt them this Friday to take to a friends for the weekend. Do any left overs need to be put in the fridge or freezer or can they be left at room temperature? I’d keep them in the refrigerator. Is step 3 a separate bowl from step 2? I want to be accurate and ensure a fantastic dessert…. practicing this recipe for tomorrow since we are celebrating thanksgiving on Friday at my sister’s house! It’s the same bowl from step 2. In the end, you’ll have one bowl with the pumpkin mixture and another for the cream cheese mixture. Hope this clears up any confusion! Enjoy!! I’m looking forward to making this today, looks so delish! My only question, the vanilla is listed twice, was that typo or the amount it should be? Thanks! Yes, those are the amounts you’ll use. The first teaspoon is for the pumpkin mixture and the second teaspoon is for the cream cheese layer. Sorry if that was confusing. I hope you enjoy them!! If you make these again, a video would be very helpful, or at least a more specific explanation on how you got the cream cheese to stay in “blobs.” I made these last night for a co-worker’s birthday, and the cream cheese was pretty much completely mixed in with the pumpkin batter, because I had to keep mixing the batter to make sure the cream cheese was spread throughout. They still turned out really good, but I really wanted the taste of the cream cheese separated from the pumpkin, like your photos. That’s a bummer but I’m glad they still tasted very good! 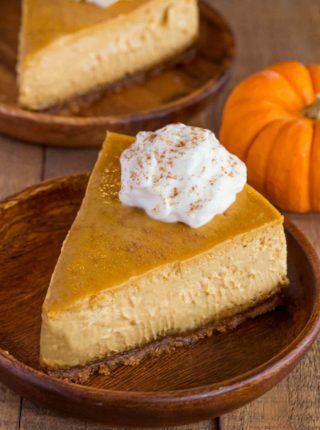 Next time when you’re putting the cream cheese mixture in with the pumpkin mixture, try spooning it in and then taking a toothpick to swirl to mix. That should allow it to mix without loosing the difference between the two mixtures. Also, make sure to use an ice cream scoop to fill the muffin tin. That’ll help the mixture from moving around too much as well. I hope this helps! How would this turn out in mini muffin form? Awesome idea though you’ll want to cut back the bake time to 13-15 minutes. Enjoy!! Hi Karen, Just wondering if you made them into mini muffins? And if so how did they come out? Thank you so much for the 5 stars! I’m so glad you all enjoy them. Just to be sure, are these regular sized muffins or mini muffins? Can you explain foil liners? Still need to use muffin tin? Thanks, they sound delicious! Regular sized muffins. Yes, use the muffin tin because the foil can’t hold the weight of the batter. I hope you love the muffins! It’s a very interesting fall recipe, I liked it. I also love the idea of using ice cream spoon. Thank you! What is the last vanilla? Vanilla extract? 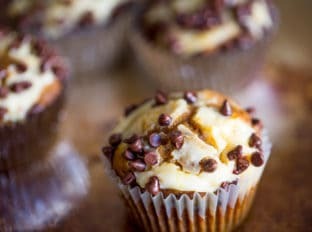 I would love to make these but I don’t understand what vanilla is. Thank you so much for catching that! It should read pure vanilla extract. I edited it to show correctly now. So sorry about that. Hi! I’m confused about the cream cheese amount. Do you use 8oz of cream cheese or two packages of cream cheese (which come in 8oz portions)? Just want to make sure I use the right amount since I’m thinking I’d love to try these. Thanks! So sorry about that. It is supposed to read 8 oz of cream cheese at room temperature. I edited the ingredient list to reflect the correct amount. Thank you so much for catching that! Hope you enjoy them!! Are you using Plain flour or Self-rising flour? I could use a batch of these right now! I need to make these very soon! I’m not usually a baker because I hate the mess. These were worth it! I will be pinning and making again soon. Thanks, Jayne! I’m so glad you thought my recipe was worth the cleanup! Oh yum! This is my kind of breakfast! Chocolate for breakfast is awesome!! These are absolutely gorgeous! I love the flavors here (chocolate and pumpkin and cream cheese?! The trifecta for sure)! These sound dreamy! I need to bake them up! oh, Oh, OH that looks good! 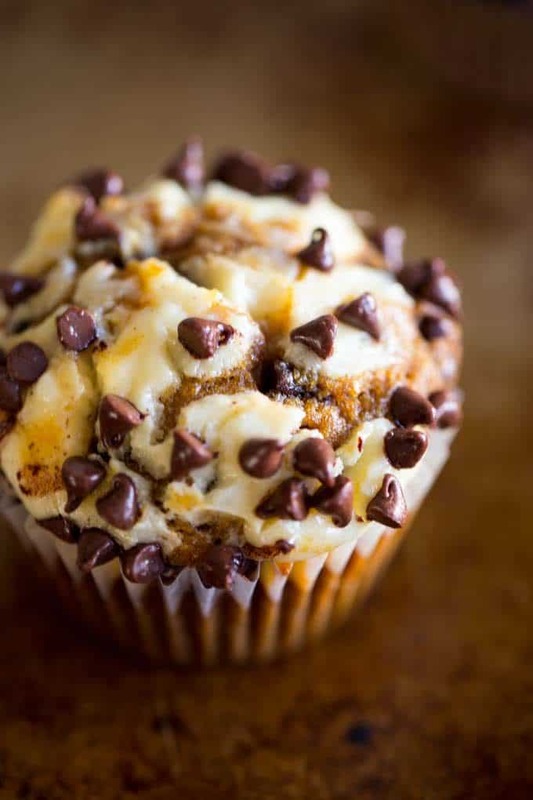 I can’t even begin to tell you how badly I want one of those muffins right now! 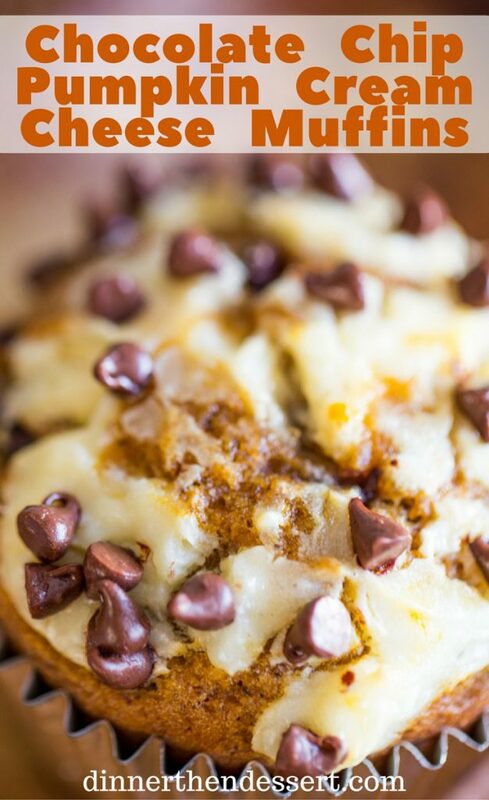 The chocolate, the pumpkin and the cream cheese…heaven!